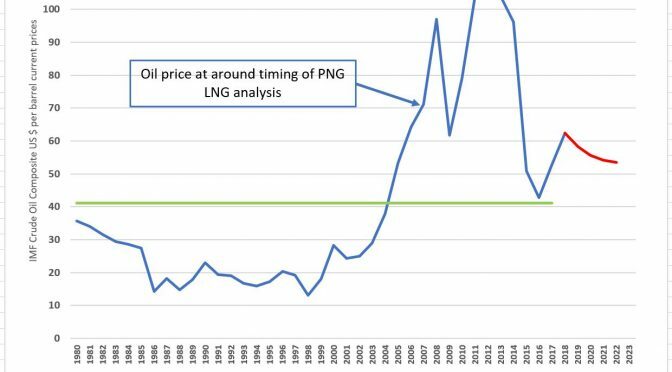 The yawning chasm between PNG LNG benefit predictions and its adverse impacts on the PNG economy (see here and here) has little to do with the fall in oil prices. Claiming so is a poor and inaccurate defence. The PNG LNG modelling done in 2008 accurately predicted export sales revenues for 2015 and 2016. While oil prices were some 25% below the model’s mid-case scenario, this was fully offset by actual LNG production being some 25% higher than 2008 expectations. Price falls were matched by production increases – sales revenues were as predicted. As the marginal cost of production is low (most costs of LNG production relate to the high initial capital costs), sales revenue is the driver for expected benefits. Export sales of petroleum products increased by almost exactly the predicted 440% – from K2 billion in 2013 to K11 billion in 2016. 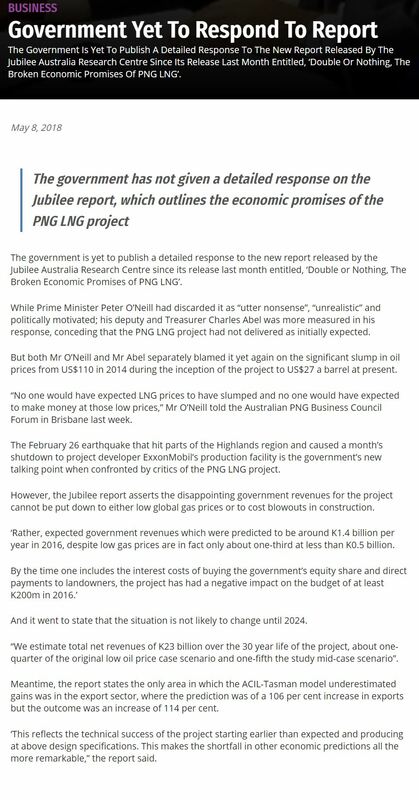 So the failure of the PNG LNG to deliver benefits as predicated has little to do with the fall in oil prices in 2014. Of course oil prices did fall from over $US100 per barrel in 2013 to under $US30 per barrel (for a very short time early in 2016). And of course, it would have been really nice for the PNG LNG project and government revenues if the price stayed at $US100 per barrel – although less so for PNG motorists! However, as stated by the Chair of Oil Search at the recent AGM, there is a need for a long-term perspective on projects such as PNG LNG which operate for decades. This long-term perspective is that oil prices from 1980 to 2017 have averaged just over $US40 per barrel – considerably lower than the 2015 to 2017 average of $US50 per barrel. This is shown in the following graph. The blue line shows the yearly movement of oil prices from the IMF’s commodity price database. The green line shows the average oil price from 1980 to 2017. The oil price was below this level for the vast majority of this period. Oil prices jumped upwards strongly in the 2000s, but it was always going to be risky to assume such levels would persist. Commodity cycles see prices rise and fall. 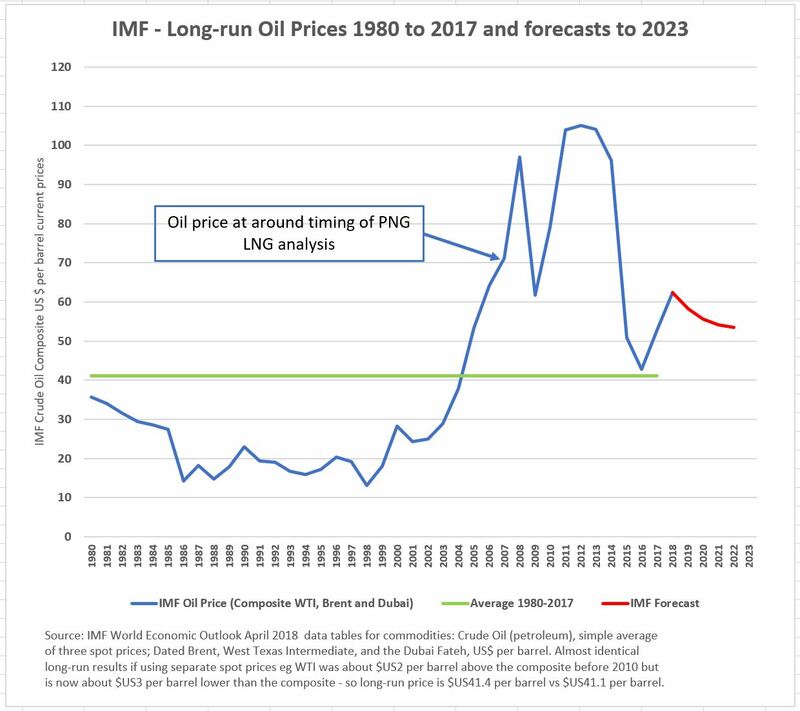 Currently, the International Monetary Fund’s international commodity price forecast is that oil prices will drop below $US60 per barrel next year (shown by the red line in the graph above). The New York Futures market has the price dropping from current prices of over $70 per barrel to under $60 per barrel by 2020. Anyone who was planning, even if only in their own mind, for oil prices to stay around $US100 per barrel was really betting against the odds and history. This would not be the way to plan for a country’s growth and development or how to plan for budgets. To do so would be utter nonsense. The mid-case analysis for the PNG LNG model was $US65 per barrel. Put in a long-term perspective, while possibly understandable in the 2007 bubble before the global financial crisis, it was a somewhat optimistic mid-case perspective. It was well above the experience of the previous decade. The PNG LNG analysis also used other scenarios. The low-case scenario was $US36 per barrel – and the project was still economically viable at that level. The above is written to hopefully correct a mis-understanding of the recent “Double or Nothing” report by Jubilee Australia on which I was a co-author (see here). The lack of benefits relative to predictions is not due to the fall in oil prices. Extracts indicating this confusion are included at the end of this blog. Rather, as covered in the report, there are several gaps that need explanation. The first relates to the poor modelling of benefits which led to wildly grandiose promises. The report focused on assessing the predicted benefits to the whole economy 2 years after PNG LNG exports commenced as this was modelled by PNG LNG partners – and there was 2016 data available to test these claims. The long-run estimated impacts (which generally were almost identical to the short-run impacts) can be re-assessed in early 2020s – until then, we can only comment on the wildly inaccurate short-run predictions. There were and are some local benefits. As indicated in a subsequent Jubilee Report “On Shaky Ground” (see here), there have also been some adverse local impacts and broken promises at the local level (both lack of infrastructure and general non-payment of royalties). But from the perspective of the economy as a whole, PNG is now doing worse than its performance prior to PNG LNG. It has fallen below trend on most economic welfare indicators such as overall employment growth, government expenditure growth, non-resource sector growth (the best available measure for PNG household incomes) and imports. 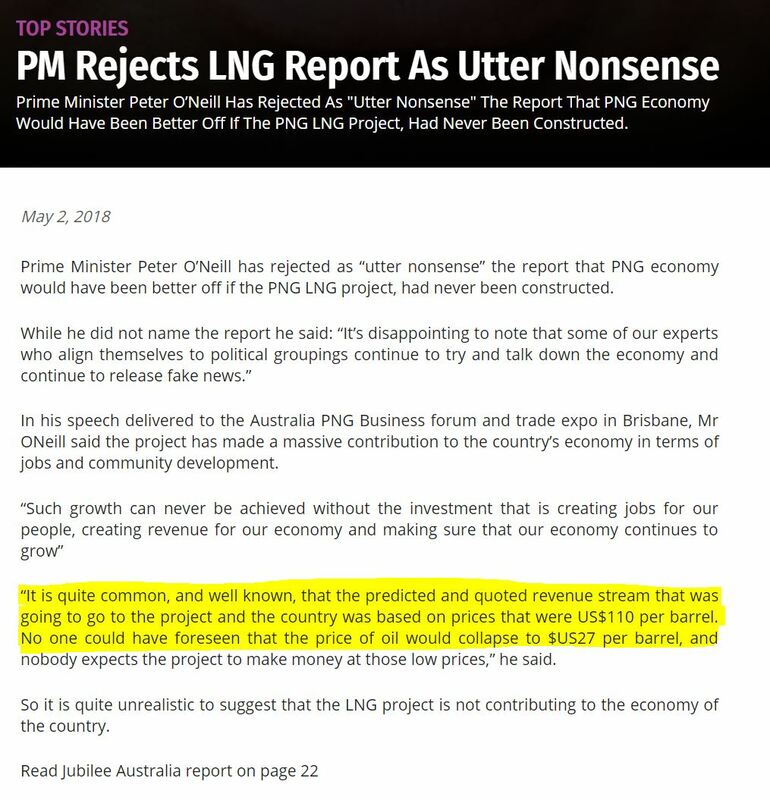 This is surprising, because the potential benefits of PNG LNG (always much lower than the grandiose predictions of project partners) would still have been expected to have small positive spin-offs for most of the rest of the economy. This did not happen. As the report analyses (see sections 5.4 to 5.7 for detail), the most likely explanation for this is that the PNG LNG project encouraged poor policy decisions. The impacts of these poor policy decisions are swamping any local benefits. These decisions indicate PNG has fallen yet again into a resource curse. PNG should learn from its own history and that of other resource rich countries. Pretending the problem was a fall in oil prices is both inaccurate and misses the point that PNG needs to change its policy settings towards more inclusive development and project partners need to stop over-stating potential benefits. Another indication of the oil price slump as being the cause for the lack of benefits, when PNG LNG export sales revenues are almost exactly are predicted.